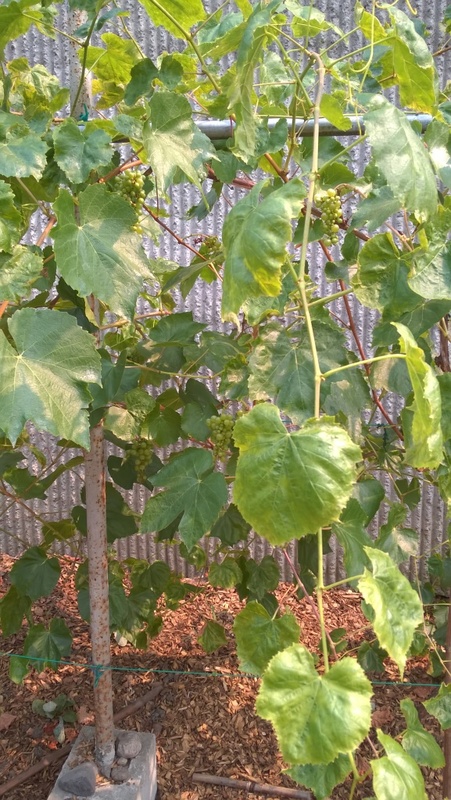 The predictable announcement was, “Yum!” from anyone who tasted our Interlaken table grapes. One taster cocked her head and let her eyes drift upward, savoring the sweet with a little tart sensation. We were thankful to have a few grapes this year! Last year was a bust due to powdery mildew. In 2017, the grape clusters shriveled and dropped. We knew we needed a plan for the 2018 season. Our first step was to sign up for another class from the grape guru Michelle Moyer (WSU – Prosser). Michelle explained: Powdery mildew (Erysiphe necator) comes in many forms. 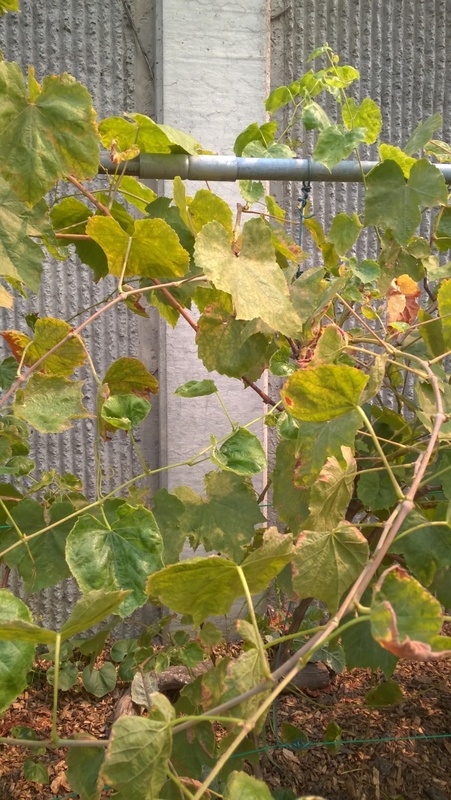 A vine is most susceptible when temperatures are 68F to 86F and humidity is moderate (40-75%), conditions that are quite common in Western Washington during the growing season. Sat, Oct 6, 2-5, CIDER FEST! In cool climates, powdery mildew typically shows up one month after bud break – approx. May 30. Weather During Critical Epidemiological Periods and Subsequent Severity of Powdery Mildew on Grape Berries. Plant Disease 100:116-124. Moyer, M.M., D.M. Gadoury, W.F. Wilcox, and R.C. Seem. 2016. 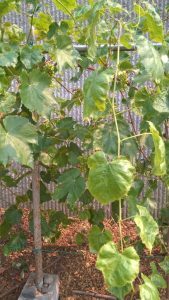 Proper pruning, including fruit-zone leaf removal and shoot thinning, to facilitate air circulation and sun light penetration is critical to aid in the control of powdery mildew. UV exposure and air circulation are both effective against this fungal problem. Sadly, our most mature set of three vines rest along the sound wall where air circulation is compromised. Michelle referred to a study by Matthew DeBacco (2011) wherein compost tea and milk spray were used to combat powdery mildew. We were not absolutely consistent in our applications but we tried to spray about every week to 10 days. Our results (see photos) were convincing; the powdery milk spray was the most effective. All clusters dropped on the control and all but one on the vine sprayed with neem oil but we did have clusters ripen completely on the milk treated vine. Next year we plan again to spray using an improved milk recipe per the studies we’ve read. We’ll use a backpack sprayer to make the process more efficient. We’ll also prune more effectively in February and remove fruit zone leaves a bit earlier than we did this year. We may try compost tea as a test spray against the milk spray. However, making the tea every other week is quite a process so we shall see. P.S. On a recent visit to Carnation Farms, the garden supervisor mentioned that she has had luck treating basil with powdered milk spray. 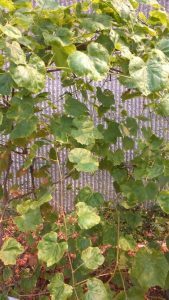 This entry was posted in Plants, Uncategorized and tagged grapes, milk spray, powdery mildew on September 23, 2018 by Nancy. Yay for Nancy’s grape enthusiam!